Lachen is the sister village of Lachung in North Sikkim and is the base for tours to Gurudongmar lake and Chopta valley. Situated at an altitude of 8838 ft, the small town is a good 6 to 8 hours drive from Gangtok (depending on road condition) along the North Sikkim highway. Lachen stands on a grassy and bushy flat land separated by deep gorges of river Lachen-Chu from where rises the pine clad mountains with their snowy peaks and black cliffs. The village comprises of nearly 250 houses, earlier inhabited only in winters by the owners who spend the summers on the alpine pastures along the Tibet border tending to their herd of yaks. We are proven to be the best taxi service provide in Lachen valley North Sikkim. We provide - NJP to Lachen valley Taxi Services, Bagdogra to Lachen valley taxi Services, Gangtok to Lachen valley taxi services fare, Siliguri to Lachen valley taxi services, Kalimpong to Lachen valley taxi services, Pelling to Lachen valley taxi services, Darjeeling Lachen valley Lake taxi services, Lachen valley to Zuluk cab rental, Lachen valley to Darjeeling cab rental, Lachen valley to Kalimpong cab rental, Lachen valley to Pelling cab rental, Lachen valley to Siliguri cab rental, Lachen valley to NJP cab rental. We also provide packege tour over Lachen valley. Tourists has to travel from Gangtok city to Lachen valley or Thangu valley on first day (the nearest village where accommodation is available) by booking a full or Shared Vehicle. A journey to the Gurudongmar Lake starts early in the morning around 4.30 am from Lachen and it takes around 4 hours via Thangu valley ( a breakfast point). Vegetation is very limited and the road is through stony moraine like unpaved path. Due to proximity to the Chinese Border, landmines are common and presence of Indian Army is ubiquitous. Due to high altitude breathing problems may also arise. Tourists are suggested to spend little time at the high altitude and come down to Lachen soon. Mostly visitors are not allowed to stay in the lake after 11.30 am due to heavy flow of winds. Gangtok to Lachen valley : 128 kms. Lachen to Thangu valley : 30 kms. Thangu valley to Gurudongmar Lake: 38 kms. Toruists have stay at Lachen valley or Thangu valley on first day (the nearest village where accommodation is available). Due to high altitue and lack of oxygen childrens below 8 years aren't allowed to visit the lake and any tourist with heart diseases / problem are suggest not to visit this lake. Passport Size Photo : Two Passport Size photo for each members above 5 years. Foreigner : are stricly not allowed to visit the Gurudongmar Lake due to proximity to the Chinese Border. Foreigners are allowed only upto Thangu Lake to visit with below documents. Passport Size Photo : Four Passport Size photo for each members above 5 years. Passport : Two Xerox copy of Passport is required. Visa : Two Xerox copy of Visa is required. Inner Line Permit (ILP) : Two Xero x copy of ILP is required also required. This ILP is created in sikkim border either in Rangpho or Melli before entering sikkim. Thangu Valley : Both Indian and Foreigner are allowed to visit Thangu Valley. Best time to visit Lachen valley north sikkim is during the months of March, April, May, June, October, Nov. Most of the roads remains closed during the month of July, August due to heavy rainfall and landslides. Also some of the tourists don't prefer to visit Lachen valley north sikkim in the months of December, January and Febrary due to cold climates. Flt Lt Elvis: 'Amazing' is the best word to describe CabinSikkim' services. I contacted Mr Prem Mainali over phone and communicated my tour plan. Within few minutes I received a detailed plan on "where to go and what to do while in Sikkim" and the price quote. I took Innova/Scorpio since the terrain needs SUVs. The vehicles were very clean and the drivers were very polite and punctual. Ask for Mr Prema (Driver) if you are going towards Lachung. Overall, we had a great trip and that wouldn't be possible without the meticulous planning of Mr Prem and his business partner Mr Praveen. Thank you, Cabin Sikkim. Virendra: I had accidently landed on this page and belive me i used the services of Cabsinsikkim. It was an pleasant expirence i had using the services of Prem. He is an professional who would ensure that his services are upto the mark. WOuld recommend everyone going to sikkim to use his cab services , if you want your travel to be pleasant. Thank you prem for all the help and support extended during my stay from 2nd october to 5th october. Pratibha Baviskar: We used the services of cabinsikkim, for our travel in Sikkim and Darjeeling for 10 days. Mr Premji is a very helpful and flexible. All the cabs provided by him were in a good condition, and all the drivers were polite and punctual. Driver Manorath and Bikas were safe and cautious drivers. Manorath is very polite. Bikas has excellent driving skills. I recommend the services of cabinsikkim. We had a fun trip . Tappan Patel: Two words to describe Cab in Sikkim. "Extremely Good". Prem is an excellent person, very accommodating and courteous. He's got a bunch of young drivers you can trust on some treacherous roads. My recommendation is a young kid named Kiran. Aditya Jagnani: it was awesome to be associated with Cabinsikkim..Prem ji managed so well..he was very flexible in every respect..the question of doubt should nt be there when dealing with him.. thanks a lot for the successful and happy trip..
Keyur Modi: Very good experience with Mr.Prem of our Gangtok,lachung,pelling,& dargileeng tour. He is very flexible with us like a family member. We are fully satisfied for his excellent service. darjeeling car rental, bagdogra, njp to darjeeling taxi, gangtok to darjeeling taxi..
Why cabinsikkim is a better Choice? You can call us travel-maniac, nature lover, wanderer but we love to call ourself - A team that lets you feel the beauty of nature the way you never felt before. A team that for sure will make you cherish every moment that you spent with us while exploring and enjoying this beautiful place on earth. Yes, we are for for you - we are CABinSIKKKIM.com. We are the number one car rental services in gangtok and darjeeling areas. We have the knowledge, expertise, vast experience and most importantly well tarined and well behaved tour guides / executives to make your trip a memorable, enjoyable and comfortable. Everyone says they are unique, and so we do. But we do justify how are we unique. 1. Our drivers are not just drivers. They are your tour and road companions. They will guide you, serve you, entertain you and will take care of you. 2. We respect your language and try our best to get someone who speaks your language to assist you. 3. Our TAXIs are having both national and international calling facilities. They are pre-paid SIMs. It is simple – You need to pay the airtime you have used. These are our facilities to help you and not commercial. 4. Our uniqueness lies in the warmth of our reception. We are always at your service. 5. Our specialists offer you trips tailor-made as per your budget and time that suits you. Our experience and service together with your passion will make a difference and will ensure that you have authentic experience to sikkim's most scenic locations and an effortless and fun-filled trip. We provide taxi services for Sikkim traveller, Sikkim tour, Sikkim cab services, Sikkim taxi packages, Sikkim taxi, Sikkim cab, Sikkim taxis, taxi service in Sikkim, taxi in Sikkim, cab in Sikkim, Sikkim car rental, taxi in Sikkim, sikkim taxi fare list, tour packages to sikkim, place to visit sikkim. We provide taxi services from NJP and Bagdgora. You can contact us for NJP to Gangtok car fare, NJP to Gangtok taxi fare, Bagdogra to Gangtok taxi, NJP to Pelling taxi fare, Bagdogra to Pelling taxi fare, NJP to Gangtok package tour, Bagdogra to gangtok taxi fare, NJP to gangtok taxi, NJP to gangtok car fare. We provide taxi services for North Sikkim, Yumthang valley, Gurudongmar lake, Yumesamdong, Zero Point, Lachung, Lachen. Contact us for Gangtok to Yumthang taxi fare, Gangtok to Lachung taxi fare, Gangtok to Gurudongmar lake taxi fare, Gangtok to lachen taxi fare, Gangtok to Yumesamdong zero point taxi fare. We provide taxi services for East Sikkim, Silk route tour, Changu lake in Sikkim, Baba Mandir, Nathula Pass, Gnathang valley, Zuluk, Kupup lake. Contact us for Nathula pass permit cost, Gangtok to Changu lake taxi fare, Gangtok to Nathula pass taxi fare, Gangtok to Gnathang taxi fare, Gangtok to Zuluk taxi fare, Gangtok to Phadamchen taxi fare, Gangtok to Aritar lake taxi fare. We are best taxi services in Gangtok, Sikkim. Contact us for Gangtok car rental, Gangtok car rental services, Gangtok taxi, tour to Gangtok, Gangtok visiting places, Gangtok sightseeing, Gangtok package tour, gangtok to darjeeling taxi, cab service in Gangtok, taxi service in gangtok, Gangtok to Pelling taxi fare. Our taxi services includes taxi services in West Sikkim. Contact us to book taxi services in Pelling, Pelling sightseeing, Pelling taxi, Pelling to Yuksom taxi fare, Pelling to Ravangla Buddha park taxi, Pelling to Namchi chardham taxi. We also provide taxi services in South Sikkim. Contact us to book taxi services in Namchi Chardham, Ravangla Buddha park taxi, Taxi Services for full day, Half day sightseeing in Namchi, Ravangla, Temi Tea Garden, Samdruptse, Sai Mandir. City Taxi, Inter City Taxi, Package Taxi for sightseeing for Gangtok, Pelling, Sikkim. Taxi services for Bagdogra Airport Siliguri to Darjeeling, Kurseong, Kalimpong, Sillery Gaon, Lava & Lolegaon, Ichhe Gaon, Rishop. Taxi services for NJP Rail Station Siliguri to Darjeeling, Kurseong, Kalimpong, Sillery Gaon, Lava & Lolegaon, Ichhe Gaon, Rishop. 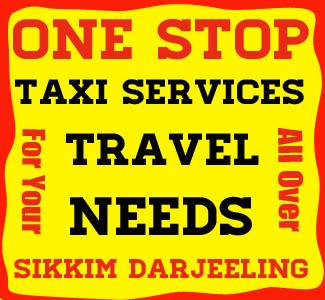 Taxi services for Darjeeling, Kalimpong, Kurseong, Sillery Gaon, Lava & Lolegaon, Ichhe Gaon, Rishop. City Taxi, Inter City Taxi, Package Taxi for sightseeing for Darjeeling. City Taxi, Inter City Taxi, Package Taxi for sightseeing for Kalimpong. City Taxi, Inter City Taxi, Package Taxi for Sillery Gaon, Lava & Lolegaon, Ichhe Gaon, Rishop. Your smile is the measure of our success...!!! Share happiness, Let your owns feel special and get many reasons to smile. We value relations. We value your emotions. We care for you and we care for your near and dear ones. This is a very special feature that we are proud to talk about. Concept is simple - Gift a tour for your near and dear ones and let us know their likes and dislikes and leave the rest to us. Let our guest be the testimony of our hospitality, care and warmth. We will make them feel special every moment and will bring a huge smile on their face, which in turn will give you all the satisfaction.